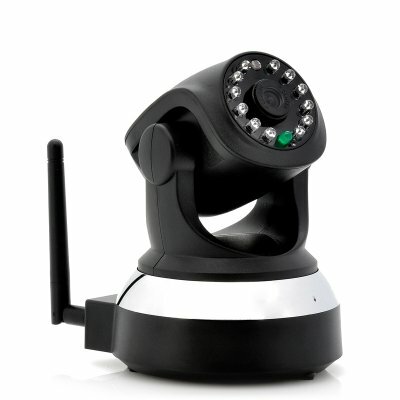 Successfully Added Wireless Wi-Fi IP Camera "Scar" - 720p, Pan/Tilt, SD Card Recording, Double IR Cut, Two Way Audio to your Shopping Cart. Wireless IP Security Camera with 1/4 Inch Color CMOS sensor, 720p recording, two way audio, SD Card Recording and Pan/Tilt functionality. Wireless surveillance just got a lot easier. 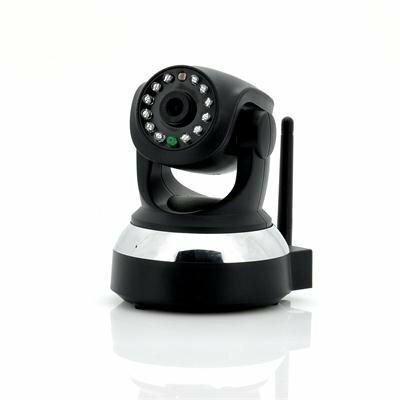 Setting up your own security network in just a matter of minutes is now possible thanks to the “Scar” Wireless IP camera. After installing the software on your PC the “Scar” will automatically configure itself. After completing the easy installation, be able to access the live stream of the camera by simply logging in using a PC or your Android phone/iPhone! Shooting 720p HD images using its 1MP sensor, the security footage will always be crystal clear even under low light conditions thanks to the 12 Infra Red LEDs providing night visibility up to 15 meters. Filtering away unwanted infrared light is the double IR Cut, resulting in an even better video quality. But the best part about the “Scar” wireless security camera is its ability to rotate 350 degree horizontally and 90 degree vertically. This way, you’ll have a much broader field of view than other traditional surveillance camera and you’ll be able to cover a whole room with just one camera. And if that wasn’t enough, use the built-in microphone to listen to what is going on in the room. And even talk back by hooking up your own microphone. Don’t have a DVR to record the security footage? Thanks to the “Scar’s” built-in DVR, you won’t even need one. Recording the footage directly to a MicroSD if needed, this camera is a perfect home or office security camera. Making sure your property is always guarded, the “Scar” is now in stock. Ready for dispatch within 24 hours of ordering, this wireless camera comes with a 12 month warranty. Brought to you by the leaders in wholesale IP Cameras, Chinavasion.